Body: 1.1- 1.4m (3 1/2- 4 1/2ft). Tail: 65-80 cm (25 1/2- 31 1/2in). Weight: 100-130 Ib. Cub Weight at Birth: 150 - 300 grames. Litter size: Up to 8 cubs. Habit: Female solitary; male lives in small groups. Diet: Antelope; also hares, rodents, sometimes larger prey such as zebra. Lifespan: About 12 years in the wild, more in captivity. 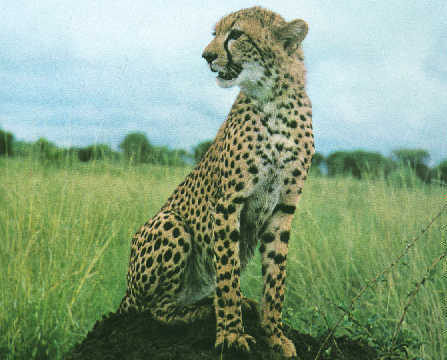 An endangered subspecies of the cheetah, Acinonyx jubatus venatiecus, lives in Asia. 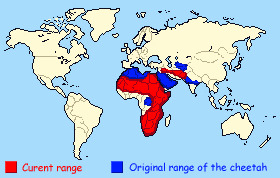 Found mainly in South and East Africa, the Middle East, and southern Asia. The world's fastest land mammal, the cheetah, is the most unique and specialized member of the cat family and can reach speeds of 70 mph. Speed Demons The cheetah's flexible spine, oversized liver, enlarged heart, wide nostrils, increased lung capacity, and thin muscular body make this cat the swiftest hunter in Africa. Covering 7-8 meters in a stride, with only one foot touching the ground at a time, the cheetah can reach a speed of 110 km/h in seconds. At two points in the stride, none of its feet touch the ground. Unlike other cats. The cheetah is easily distinguished from other spotted big cats by its light build, small head, and long legs. These features, together with its large lungs, are perfect adaptations for high-speed chases after antelope in the African grasslands that are its home. Unlike true big cats, cheetahs can purr as they inhale, but cannot roar. By contrast, lions, tigers, leopards, and jaguars can roar but cannot purr, except while exhaling. However, cheetahs are still considered by many to be the smallest of the big cats. While it is often mistaken for a leopard, the cheetah does have distinguishing features, such as the long tear-drop shaped lines on each side of its nose that run from the corner of its eyes to its jaw. The body frame of a cheetah is also very different from that of the leopard, most notably so in its thinner and extra long tail.The cheetah's tail usually ends in a bushy white tuft. King Cheetahs also have a rare fur pattern mutation: cheetahs with larger, blotchy, merged spots are known as 'King Cheetahs'. It was once thought to be a separate subspecies, but it is merely a mutation of the African Cheetah. A 'King Cheetah' has only been seen in the wild a handful of times, but they have been bred in captivity. The cheetah is generally considered to be an animal of open country and grass lands. This impression is probably due to the ease of sighting the cheetah in the shorter grass. However, cheetahs use a wider variety of habitats, and are found often in dense vegetation and even mountainous terrain. Since cheetahs rely on sight for hunting, they are more active in the day than night. In warm weather, they move around mostly during the early morning and late in the afternoon when the temperatures are cooler. The male and female cheetah have different lifestyles. The female spends up to 20 months looking after each litter of cubs. She lives an otherwise solitary life. She is not aggressive to other cheetahs, preferring retreat to attack. Nor is she territorial, although her range may overlap with those of other females. The male is rarely solitary. He lives and hunts in an all-male group of four or five animals. The group may be brothers from the same litter that stay together for life. Fiercely territorial, each male group scent-marks its boundaries with urine. If other males intrude on the territory of an established group, fights occur, sometimes resulting in the death of the intruder. The female's scent tells a male when she is sexually receptive, although once the male has picked up her scent the pair communicate using a series of calls. The cubs may be born at any time of the year. After mating the male leaves the female, who rears the young when they are born, about three months later. The cubs are born in a den and are blind and helpless for about 11 days. Once their eyes open the mother carries them to different dens every few days. These moves ensure a clean den and reduce the risk of predators, such as lions, sniffing out the vulnerable cubs. The young are weaned at about three months; then they follow their mother to each kill and share her catch. They leave her after 13 to 20 months but remain together as a litter for a few more months when fully mature. The females leave first, followed by the males, who set off together. The cheetah preys on hoofed animals such as impala and gazelle, as well as hares and rodents. Most big cats lie in wait for prey and pounce when it comes within range, but the cheetah's hunting technique is wholly original. The cheetah first stalks the herd. At the right moment it shows itself and panics the animals into running. The cheetah follows at high speed, usually catching up to its prey within a minute. If forced to run longer than this the cheetah gives up. The cheetah does most of its hunting during the day when other predators are sleeping. This is probably because the cheetah is easily frightened off its food even vultures can force a cheetah to abandon its kill. The cheetah often. drags its prey to a safe place and eats its fill. It then leaves the remains to other animals. Although many sources list six or more subspecies of cheetah, the taxonomic status of most of these subspecies is unresolved. Acinonyx rex—the king cheetah—was abandoned as a species after it was discovered that the variation was caused by a single recessive gene. The subspecies Acinonyx jubatus guttatus, the woolly cheetah, may also have been a variation due to a recessive gene. The cheetah was trained by man for hunting as long ago as 3000 B.C. Cheetahs were once raced against greyhounds. From a standstill, the cheetah can reach its top speed in about three seconds. Cheetahs seldom pursues prey further then 500 yards. The genus name, Acinonyx, means "no-move-claw" in Greek, while the species name, Justus, means "manned" in Latin, a reference to the mane found in cheetah cubs. It is the only cat that cannot completely retract its claws. 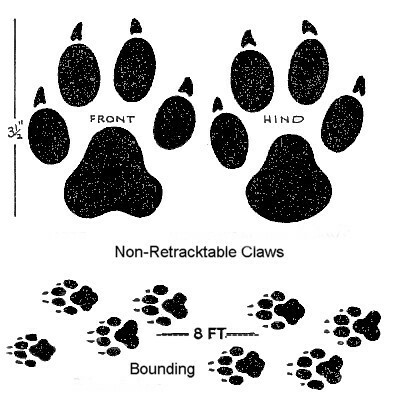 Even when retracted, the claws remain visible and are used for grip during the cheetah's acceleration and maneuvering, performing the same function as canine claws. The English word "cheetah" comes from Hindi chit, which is perhaps derived from Sanskrit shiitake, meaning "the spotted one". Other major European languages use variants of the medieval Latin gatt us pads, meaning "cat-leopard i.e. spotted cat": French geared; Italian Sheppard; Spanish and Portuguese geared (also used chit); and German geared. The cheetah is a vulnerable species. Once widely shot for its fur, the cheetah now suffers more from loss of both habitat and prey. The cheetah became extinct in India in the 1950s.An estimated 9,000 to 12,000 cheetahs left in the world. 1. When stalking a single prey the cheetah emerges from cover in order to startle the animal into running. Other big cats use attacks that combine surprise, ambush, and hunting in a pack. 2. The cheetah follows at high speed, usually catching up with its prey within a minute. It leaps up and brings down the prey with its forepaws. 3. The cheetah suffocates its prey by closing its jaws on the animal's windpipe. It then drags the carcass to a safe place be eaten, away from other predators.